What is Innova Health Amaranth Kiwicha? 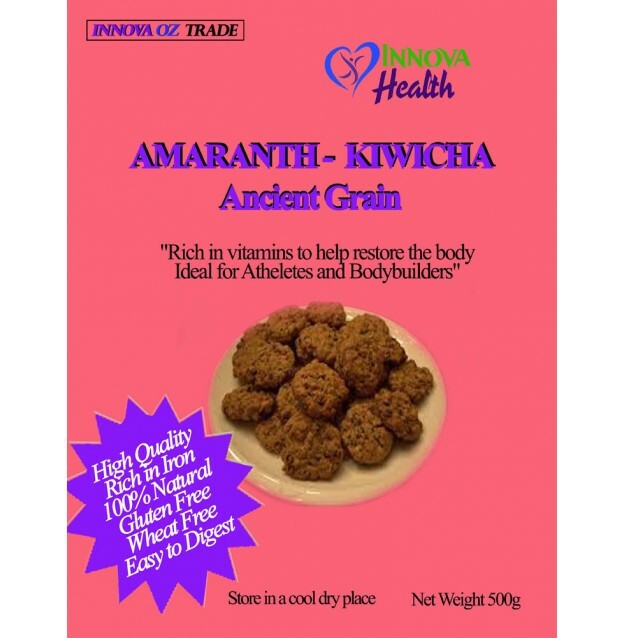 Amaranth also known by the name Kiwicha, a Super Food, it has been cultivated in America for over 7000 years; it’s use is habitual in South American countries. Peru is the leading producer where the ancestral species are harvested mainly in the valleys of Cusco, Ancash, Ayacucho, Huancavelica and Arequipa. Kiwicha is only now becoming the latest health food. South American Amaranth seeds or “Kiwicha” provide a source of protein which other mueslis can’t seem to match. This product is ideal for people with gluten intolerance as it is gluten free. It is so full of nutrients, that NASA famously gave it to it’s astronauts to eat in space in 1985 before advanced artificial foods were developed. Amaranth seeds are good source of dietary fibres; about 6% by weight constitute fibres. A serving involving 200 grams of amaranth seeds is good enough to meet half of your daily dietary requirement of fibres. Amaranth protein is high quality and may be useful for people who cannot tolerate wheat or whey protein. Kiwicha contains an impressive amount of protein, amino acids, foliate, riboflavin, antioxidants and minerals such as iron, copper, calcium, magnesium, manganese and phosphorus. It is a rich source of Vitamin A, B6, K, E and C which is good for skin. Few studies with animals and people suggest that it may help to improve symptoms of cardiovascular disease and diabetes. External applications of amaranth oil help in improving skin quality, impeding aging of skin, development of wrinkles and damage due to harsh environment. It is a perfect fuel for athletes, fitness lovers and assists with bodybuilding. It is also a great supplement for growing children and adolescents. Helps to reduce blood pressure, cholesterol, blood sugar and weight, increase immunity, treat anaemia, gastro intestinal tract disorders and other benefits from its antioxidant properties, anti-inflammatory properties and promoting healthy skin and hair. Amaranth which is gluten free is an excellent substitute for cereals. It can also be used to neutralize Celiac Disease. It’s an excellent food to help with weight loss. It has high protein content and also provides good resource of dietary fibre, which reduces calories per gram of food consumed. Amaranth reduces incidence of heart related problem. Lunasin, a peptide in Amaranth seeds and Squalene are considered to exert anti-cancer properties to Amaranth. Squalene is a chemo-protective substance and can reduce risk of cancer and has anti-tumour properties. Iron deficiency is one of the common reasons for anaemia. Amaranth seeds with high iron content can be considered good for treating Anaemia. Amaranth impacts immune function, blood sugar levels and blood pressure. Helps to fight allergies and can be seen to be used for developing anti-allergy products. Amaranth oil also supports treatment of skin diseases such as herpes, eczema, mycosis, burns, etc. Amaranth oil has been long used as home remedy for prevention of greying of hair. Application of fresh amaranth leaves paste or juice prevents hair loss and supports their pigmentation. Kiwicha is found beneficial in treatment of ulcers, diarrhoea, swollen throat and other conditions. Preheat the oven to 400 degrees F. Cut the chicken into 1½-inch cubes. Set aside. In a bowl, mix together the popped kiwicha, cheese, salt, thyme, and basil. Dip the chicken pieces into olive oil to coat, and roll each in the kiwicha mixture to evenly bread the chicken. Place the coated chicken pieces on a lightly greased cookie sheet and bake for 20 minutes, turning the chicken over after 10 minutes. Combine milk, water and kiwicha in a medium saucepan. Bring to a boil over high heat. Reduce heat to medium-low; cover and simmer 15 minutes or until most of the liquid is absorbed. Turn off heat; let stand covered 5 minutes. Stir in dried fruit and cinnamon; transfer to four bowls and top with almonds. Drizzle 1 teaspoon honey over each serving. Divide the rolled kiwicha, maca, flax and cinnamon in bowls. Pour boiling water over top and stir until the grains are fully moistened. Leave this for a few minutes to soften. Top your porridge with the chopped bananas and mango.